Please do not consider us gluttons if we were again at a restaurant somewhere in the vicinity of the Baguio City. It just so happens that D of Tracking Treasure was celebrating his birthday and we, of course, have to indulge him as he treated us for a little pre-dinner snack at Choco-Late de Batirol. 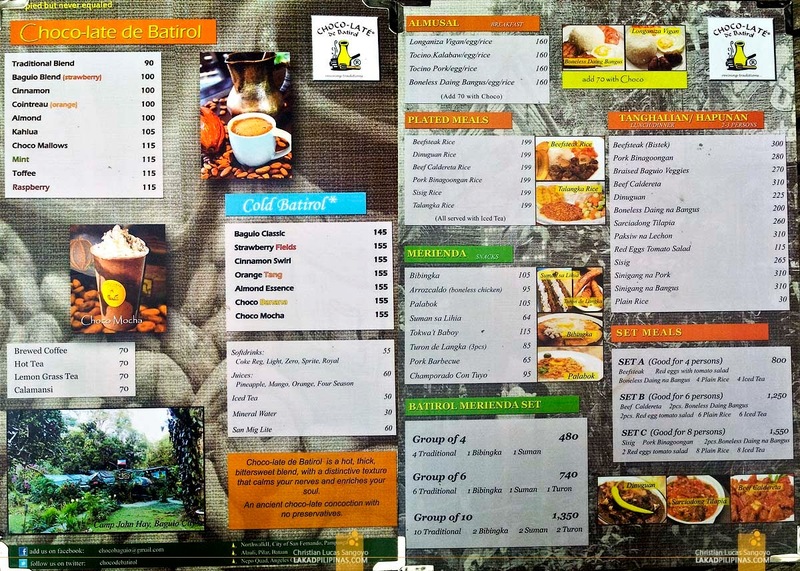 I first took notice of this little café when it was still located near the Historical Core of Camp John Hay. We always made it a point to visit the place when in Baguio City even though their dishes are a bit expensive (it ranges from Php160.00 to Php300.00). It was after all their tsokolate batirol, a rich, slightly bitter drink made by manually mixing a concoction of chocolate on a metal jar using a wooden stick, that we were really after. I was saddened then that we were unable to find it during one of our Baguio getaways. It turned out that it has simply moved camp; I was pleasantly surprised to rediscover its location near John Hay’s Igorot Park as we were about to bunk in for the night at the Azalea Residences. Choco-Late de Batirol still maintains the same atmosphere that I’ve gotten used to during my previous visits. Everything was very organic; unpaved pebble floors, solid wood and bamboo furnishings, skylight ceilings, capiz lamps and vines hanging almost everywhere. It was a literal indoor garden of sorts. We settled on one of the longer tables made from raw timber and proceeded with our orders. I really like how relaxed one can be at this place, it was so without pretensions that I can probably walk in here in sandals, shorts and sando (not that I’d ever wear sando haha) and still feel comfortable. Our evening merienda arrived in a short while; it was gonna be bibingka (Php105.00) and tsokolate de batirol with choco mallows (Php95.00). It was pretty quick considering this is a slow cook restaurant. 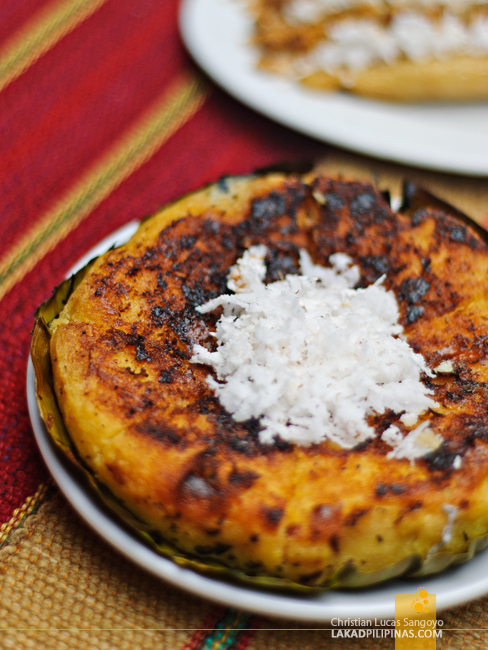 My mouth watered at the appetizing aroma of the freshly baked bibingka as it was laid down on our table. It’s about the same size as the regular ones being sold near churches during Simbang Gabi and is topped by grated coconut. Our tsokolate arrived a moment later. I haven’t tried this version with marshmallows before, always preferring the traditional blend. I took a sip and it took me back to my first encounter with the drink; it was still as thick and as delicious as I remembered it to be. Choco-Late de Batirol’s soft slightly leaf-burnt bibingka perfectly complimented the strong but not that sweet flavor of the tsokolate blend. A perfect early evening Baguio snack if there ever was one. Fully satisfying but not that filling, which is just the thing; we still have dinner to attend to. After almost three years, I was able to revisit Choco-Late de Batirol in Camp John Hay. The place is still located at the Igorot Park and it looked unchanged as from when I was last here. 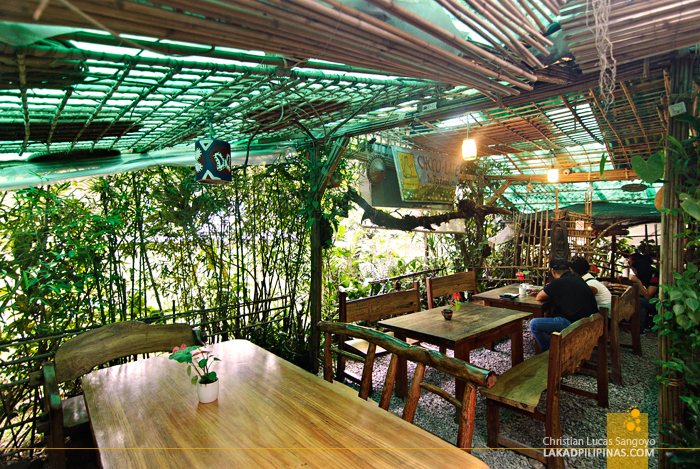 The neo-Cordilleran kitchen garden-inspired interior looks the same, but in all fairness, it doesn’t look rundown at all. 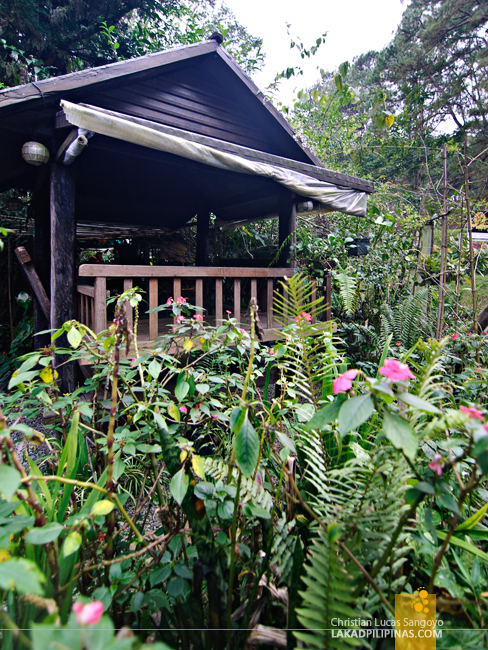 I noticed that there are new open-aired huts situated at the back of the restaurant. That’s where we decided to eat. Well, we really have no choice as the place quickly filled up the moment we arrived. 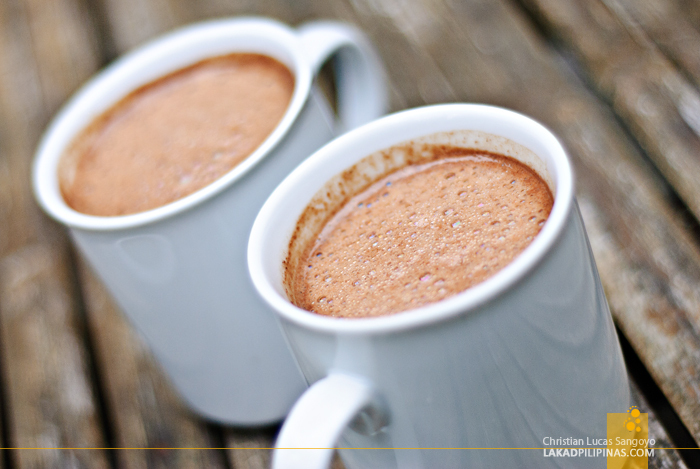 I guess everyone’s craving for an afternoon sip of their hot, thick batirol chocolate. 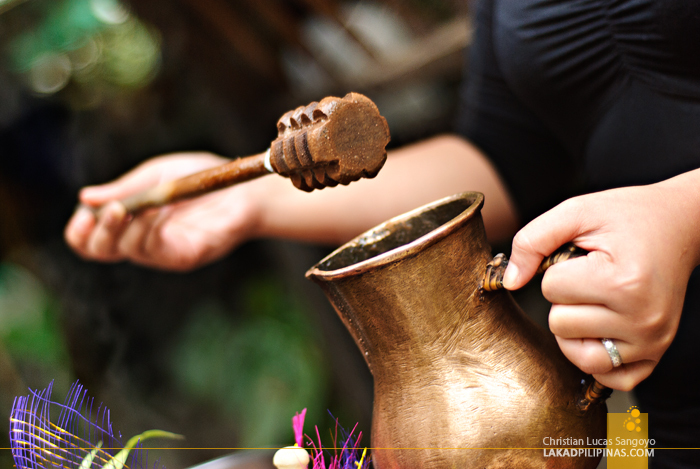 The owner’s daughter-in-law noticed us taking photos and indulged us in demonstrating how they make tsokolate batirol. She told us that unlike most hot chocos, theirs are made from paste, not from tablea. They have been serving this drink since 1996, peddling them along the streets of Session Road before getting a place in Camp John Hay. Aside from a cup of choco-late de batirol, we decided to have some light snacks to accompany our afternoon drinks. We asked for plates of bibingka (Php105.00), turon de langka (Php85.00) and suman sa lihia (Php64.00). And my gosh, I love everything especially the suman! 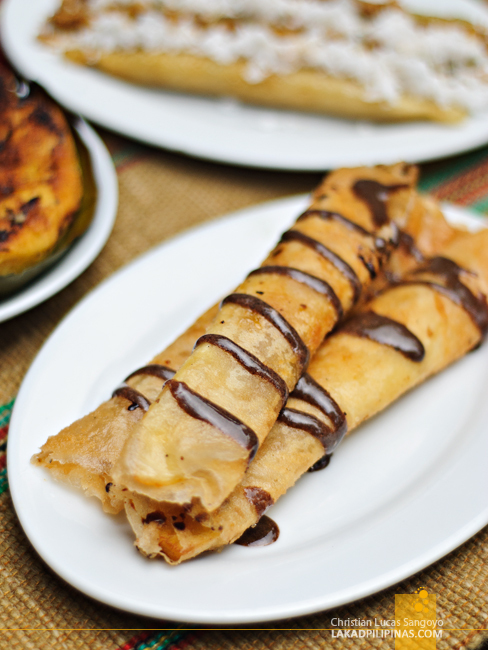 I’m not a fan of sweet stuff and I’m certainly not into suman, but Choco-late de Batirol’s version of this Filipino delicacy is simply the bomb. 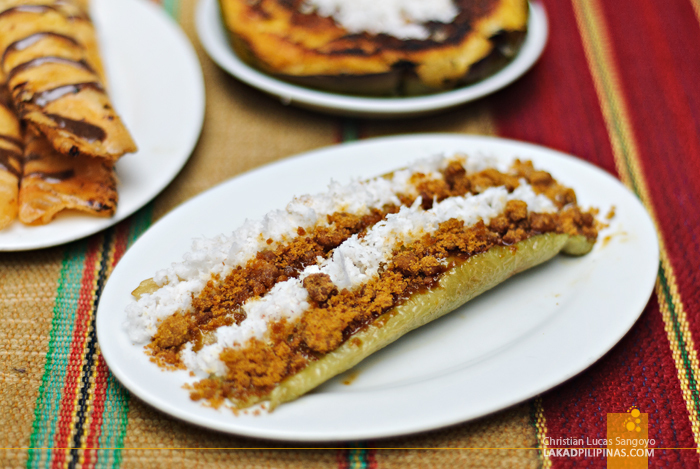 What makes it for me are the latik and bits of muscovado sugar toppings; it is sweet, but it goes rather well with the neutral taste of the suman. And their hot choco? It’s still as good as I remembered it to be from when I first tasted it almost a decade back. It’s still wonderfully thick. It’s still the right kind of sweet. And it’s still perfectly hot. The ideal afternoon companion when in Baguio City. Sayang hindi ko napuntahan 'to sa Camp John Hay ko... gusto ko talaga matikman yung famed tsokolate nila... highly recommended daw talaga. Highly recommended talaga Ian! Very very thick! I've been to Baguio 4 times yet I've never been to that place! Dang! Made me realize that my Baguio adventure is far from over. I definitely need to try that bibingka and chocolate drink. ooooooh. nasa camp john hay lang pala 'yan? i love how it looks from the outside. we'll surely drop by there this weekend.